Wow, check out that cover. These guys were trying REALLY hard to fit in with the rest of the 80s glam bands. As for sound, they were doing that too. 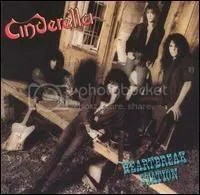 It’s still sounds like the Cinderalla I’m familiar with (Keifer’s voice is unmistakable) but with less hard rockin’ blues and more hair metal. This is a solid debut from one of the 80s most underrated hard rock bands. It’s not the generic hair metal release that I’ve seen others try to peg it as. A few songs (“Night Songs”, “Somebody Save Me”, “In From the Outside”) show what the band would later become on Long Cold Winter and Heartbreak Station.”Nobody’s Fool” was the band’s biggest hit, and it’s good, but it’s been used soooooo many times on 80s rock compilations, I think I could go the rest of my life without hearing it and be okay. Mercury labelmate Jon Bon Jovi sings backing vocals for two songs. In addition to that, he helped the band get noticed by Mercury and Bon Jovi took the band out on their Slippery When Wet tour. This no doubt helped propel Night Songs to the triple platinum status that it has attained. A great continuation of the sleazy cowboy blues rock vibe (with some funk thrown in) that the band started on Long Cold Winter. 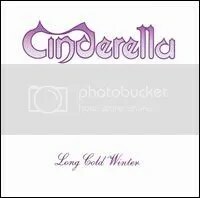 “Heartbreak Station” is definitely one of my favorite Cinderella songs and the funk rocker “Love’s Got Me Doin’ Time” is a real foot stomper. 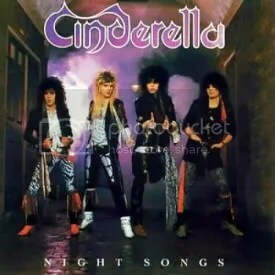 Cinderella, just like Ratt, are an incredibly underrated band. They’re one of my favorites from the 80s scene and they weren’t just a good glam/hair band, they were a good rock band… Period. Long Cold Winter is one of the finest releases from the whole glam/hair era. This is one of my favorite albums out of my whole collection. Though I certainly already knew their biggest hit (and an essential power ballad), “Don’t Know What You Got (Till It’s Gone)”, my first exposure to Cinderella as a whole was by picking up their 1997 greatest hits compilation, Once Upon A…, at Wal-Mart on cassette (!!!) in 1998 as I was scooping up any and all hair band album I could get my hands on during that time… even if that meant compilations. Eventually, that “best of” introduction led me to picking up this album.